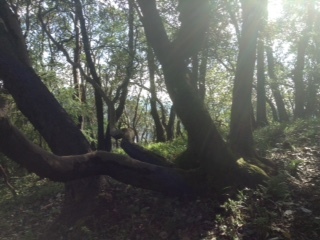 Once upon a time there was a madrone tree forest at the very top of a small hill. It stood out among all the surrounding area, because madrone trees are so very beautiful. 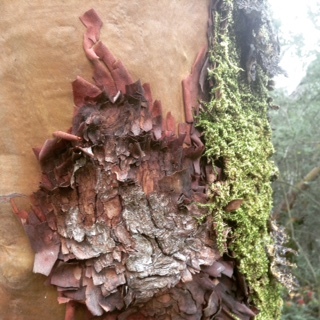 Madrone trees have bright red berries that ripen during the winter months. The bark of these trees peel back as they grow to reveal the inside of the tree. One can see that it’s made of many natural colors of deep earthy reds, fading into pale green yellows. This forest was one of the Fairy Godmother’s favorite places to visit. She called it Sylph Hill, because when she called the wind in this place, the sylphs, called wind spirits, always came to her. Well, one day the Fairy Godmother was on her morning walk as she approached Sylph hill. 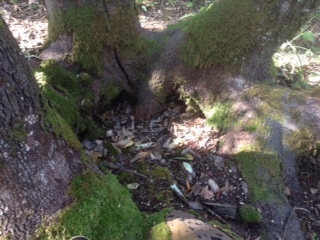 At the entrance of the forest stood a little gnome. He was young of age as far as gnomes go – only being about 350 years old. Most gnomes live well over 500 years. He had a white beard with a green velvet hat that matched the color of the moss growing upon the rocks. His trousers were reddish brown like the bark on the madrone trees. He bowed to the Fairy Godmother, taking off his cap which exposed his bald head. In the morning sun the top of his head had a shiny glow. He did not say a word to the Fairy Godmother. Instead he held out a gift for her. It was a wreath of pure white flowers that had been carefully woven together. They were the milkmaid flowers, the first blooming flowers of spring. Have you ever noticed how the very first flowers of spring are not always the showiest flowers of the field? 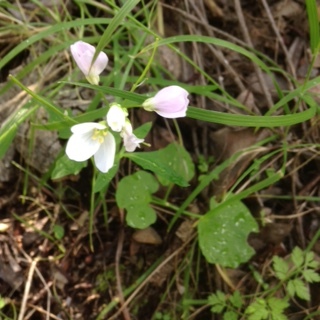 After a long winter, even the simplest flower gives one such pleasure. This was such a flower. The milkmaids were simple and pure white. The gnome placed the wreath upon the Fairy Godmother’s head. She curtsied to the gnome and said “Thank you,” as she proceeded to walk into the forest. There she found her cherished tree, she loved to sit upon. It was a large spreading Madrone, whose roots twisted all around the base of the tree. It formed a natural seat. She called this her throne, for she always felt very royal sitting upon it of course being a Fairy Godmother and having fairy blood run through her veins, did make her a queen in her own right! Now, when the Fairy Godmother came to this part of the forest, the word would spread quickly to all the nature spirits in the hills. Flower fairies, wood elves, gnomes, and pixies would all line up for the Fairy Godmother’s blessings. Many of the nature spirits would be injured by the foolishness of humans. Some would be burned from forest fires. Others would be suffering from the pollution of earth, water or air. As the Fairy Godmother directed her thoughts inward to the Divine Creator who made all of us, she would ask for healing for all the nature spirits. Her heart would open and the Divine Creator would pour love through her heart and into her magic wand in her hand. In she turn would bless each nature spirit as they walked before her in a procession one by one. It wasn’t really magic like you would think, but it was the Fairy Godmother’s love for all of God’s Creation that sparked the magic of her touch. As the love flowed from her heart into her wand, each nature spirit would instantly be transformed and become whole and healed. This is one of the important jobs of any Fairy Godmother as she walked upon the Earth. The Fairy Godmother had just touched the last little gnome, when she felt a silent presence enter the forest. It was so holy that she stood up from where she was sitting, and walked deeper into the forest to where the “presence” was standing. It was a Wind Angel, who had heard about the blessings that were taking place under the Madrone tree and had to come to see the Fairy Godmother. Sweet Little Milkmaids where can you be? To be pure of heart and pure of deed. Carry my prayers upon your breeze. May they be pure of heart as they travel with thee. 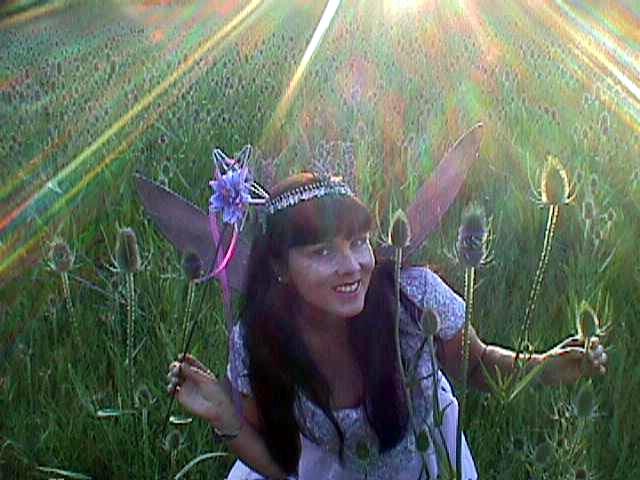 The Wind Angel gathered up all the prayers of the Fairy Godmother and raised her wings into the air, and flew away. The Fairy Godmother looked up from where she knelt on the forest floor. Putting her hand on her head she gently touched the Milkmaid wreath. Now she understood the gift from the gnome!